Some of my many skills in life consist of sleeping, eating, and putting off tasks until the last minute. If you haven’t noticed, all of my blogs were published on the 17th and 18th of September, hours before the deadline to the first blogging period. Even though I consciously tell myself to start certain tasks, I cannot seem to muster enough motivation to start. I am certainly not the only individual, as I witness hoards of Science 200 kids finish and publish their blogs hours before the due date. 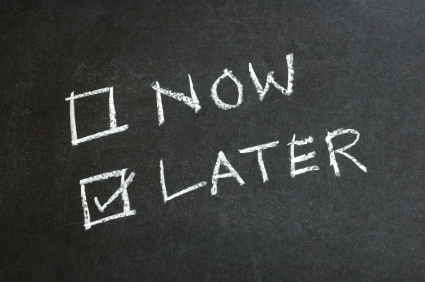 Why exactly do we procrastinate? Daniel Gustavson, a psychologist from the University of Colorado Boulder, conducted a study to learn more about why people procrastinate. In this study, Gustavson 347 twins complete surveys pertaining to their tendencies in procrastinating and impulsivity. Out of the 347 pairs, 181 were identical twins and 166 fraternal. Identical twins and fraternal twins have many differences, but the main difference is the fact that identical twins share the same genetic code. 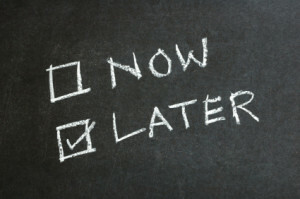 “They found that procrastination is indeed heritable, just like impulsivity. 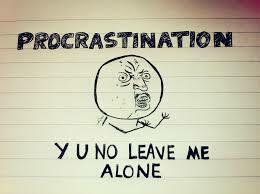 Not only that, there seems to be a complete genetic overlap between procrastination and impulsivity — that is, there are no genetic influences that are unique to either trait alone.” (Gustavson, Daniel) From the study, it suggests that procrastination indeed heritable and is from impulsivity, the behavior without adequate thought. Even though I wish to point my genetics to explain my procrastinating ways, most studies dealing with procrastination are extremely correlative. There may be many more connections, and scientists cannot yet pinpoint the cause. Another scientist that has tried to make advances as to why humans procrastinate is Laura Rabin. In one of her studies, she gathered 212 students and questioned them “for procrastination, then on the nine clinical subscales of executive functioning: impulsivity, self-monitoring, planning and organization, activity shifting, task initiation, task monitoring, emotional control, working memory, and general orderliness. The researchers expected to find a link between procrastination and a few of the subscales (namely, the first four in the list above). As it happened, procrastinators showed significant associations with all nine.” (Jaffe, Eric) Again her findings are extremely correlative, and her study was observational. I feel the reason why I procrastinate is because I minimize the actual importance of certain tasks. As a student and professional procrastinator, I tend to view priorities less when they have a due date not near the vicinity of the current date. The reason why I rather watch YouTube videos or binge on Netflix is because those tasks give me an uncontrollable amounts of joy/dopamine compared to the intimidating tasks at hand. This brings me to the fight or flight response, which is a humanlike psychological reaction. When people are given a task,such as homework, they do not wish to complete, they feel unstable emotionally. Instead, the brain tries to cover the feelings of remorse, and replace them with options of short term rewards. Even though it is not proven and there may be other causes, I feel that genetics are the ones to blame. This entry was posted in Uncategorized on September 17, 2015 by Nicolas Lau. Pingback: School Year 2015-2016 – Jacob B.